The artistic reconstruction by Andrew Spratt shows how the castle may have looked in 1250. About 7 miles South of Wick, running parallel to the cliff face off the mainland at Clyth, stands an isolated rock upon which stood what is thought to be the earliest known castle of the Clan Gunn. The castle is variously known as Castle Gunn, Castle Clyth, Castle Bruan or Gunn’s Castle and was probably established by Snaekoll Gunni or his son in the mid 13th Century. The site is also known as Buail’ na Creige or Bulnacraig. The site is a forbidding one and almost inaccessible today, except from the rocky foreshore. The peninsular rock, upon which the castle stood, almost has the profile of a shoe when viewed from the NW. A steep glacis of rock slopes up from the foreshore to the summit, which is level in height with the mainland. The foundations of the keep are barely discernible now, measuring 37 x 23 feet externally with walls some 3 feet in thickness - the whole being positioned on the NW cliff edge of the site. On the NE angle of the keep is a depression, some 9 feet in diameter and some 2 to 3 feet in depth, which is thought to be the position of a well. Andrew Spratt’s painting shows the position of the keep, rising to 3 storeys in height with a garret and hoarding. A timber palisade protects the curtilage of the site, although there is evidence that a part of this (at the top of the slope) may have been built of stone at a later date. There may have been another building measuring 24x14 feet within the courtyard but the site is a restricted one and other necessary buildings for the garrison would probably have been temporary, dispensable and situated on the mainland. There is a great deal of speculation on how Castle Gunn was accessed. Supplies could have been brought in by ship, which was a common mode of transport at the time, but it is unlikely that this would have been the only means of access to the stronghold. Winter gales, storms, difficult tides and a treacherous coastline would all have caused considerable difficulties in landing here. There is evidence of a rough stair cut into the rock on the mainland coming down a very steep precipice, which would have allowed access to the castle from the foreshore up the steep glacis of rock. It is impossible to imagine however that this could have been the main route in to the castle for all the necessary supplies of food, fuel, weapons, livestock, building & maintenance materials etc..
Other medieval fortifications such as Roslin Castle ( Text for Roslin Castle ) show that access to Castle Gunn could have been from a fortified tower incorporating a drawbridge to the mainland as illustrated in Andrew Spratt’s painting. After crossing the drawbridge and through the tower, access to the castle would be by a timber gantry up the glacis to the castle gate. Sections of this gantry would be removable in times of siege. 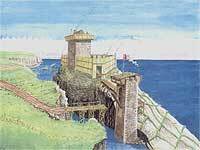 The tower as shown is a defensive feature in its own right and would have given protection to the drawbridge, the foreshore, the glacis of rock and to the keep. In turn, the keep and palisade wall would have protected the tower and there is evidence of stone foundations at the head of Hanni Geo between the castle site and the mainland. For all its impregnability Castle Gunn did not survive for long for it was soon destroyed ay an avenging father and a Royal one at that! One of the Gunns from Castle Gunn married the daughter of the King of Norway. It is not known which Gunn it was, but it was probably James de Gun’s father Ottar who was known to have visited the Norwegian Royal Court on at least two occasions. However, he already had a wife in Caithness and when the arrangements were made for the Norwegian Princess to come to Scotland, with her large dowry, he had no intention of allowing her to arrive alive and made plans to wreck the ship and recover the dowry of gold. He arranged with the Ship’s Master to make for a point called Roeberry at Ulbster where a lighted beacon was set up to guide it safely in. On the night of the ship’s arrival he moved the beacon to a more treacherous part of the coastline and the ship grounded on the rocks with the loss of all passengers and crew, including the Princess. A pot of gold was found washed up on a nearby rock and for a long time afterwards people claimed they could see metal shining in the water at low tide. This place was subsequently named ‘Leac an oir’ (flagstone of the gold). The Norwegian King took rapid revenge and sent a heavily armed task force to Castle Gunn, slaying Ottar and all his retainers and set fire to the buildings. This is a story based on tradition and although perhaps fanciful, it is probably based on fact as it does explain the early destruction of Castle Gunn at Bruan and it also re-enforces the point that the Castle was not readily accessible by sea. The Castle may have been rebuilt after it’s destruction by the King of Norway but it was eventually found to be too small and was abandoned at the end of the 13th Century in favour of Castle Halberry, one mile to the South. Much of the stonework from Castle Gunn was used to build a causeway at a nearby harbour.